From December 1982 to June 1990, Reaganomics created over 21 million jobs. The right policies can do it again. For 16 years prior to Ronald Reagan's presidency, the U.S. economy was in a tailspin—a result of bipartisan ignorance that resulted in tax increases, dollar devaluations, wage and price controls, minimum-wage hikes, misguided spending, pandering to unions, protectionist measures and other policy mistakes. In the late 1970s and early '80s, 10-year bond yields and inflation both were in the low double digits. The "misery index"—the sum of consumer price inflation plus the unemployment rate—peaked at well over 20%. The real value of the S&P 500 stock price index had declined at an average annual rate of 6% from early 1966 to August 1982. President Reagan was not alone in changing America's domestic economic agenda. Federal Reserve Chairman Paul Volcker, first appointed by Jimmy Carter, deserves enormous credit for bringing inflation down to 3.2% in 1983 from 13.5% in 1981 with a tight-money policy. There were other heroes of the tax-cutting movement, such as Wisconsin Republican Rep. Bill Steiger and Wyoming Republican Sen. Clifford Hansen, the two main sponsors of an important capital gains tax cut in 1978. 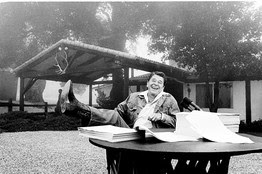 Associated Press ~ Ronald Reagan after signing his first tax cut, Aug. 14, 1981. What the Reagan Revolution did was to move America toward lower, flatter tax rates, sound money, freer trade and less regulation. The key to Reaganomics was to change people's behavior with respect to working, investing and producing. To do this, personal income tax rates not only decreased significantly, but they were also indexed for inflation in 1985. The highest tax rate on "unearned" (i.e., non-wage) income dropped to 28% from 70%. The corporate tax rate also fell to 34% from 46%. And tax brackets were pushed out, so that taxpayers wouldn't cross the threshold until their incomes were far higher. Moreover, Reagan knew from personal experience in making movies that once he was in the highest tax bracket, he'd stop making movies for the rest of the year. In other words, a lower tax rate could increase revenues. And so it was with his tax cuts. The highest 1% of income earners paid more in taxes as a share of GDP in 1988 at lower tax rates than they had in 1980 at higher tax rates. To Reagan, what's been called the "Laffer Curve" (a concept that originated centuries ago and which I had been using without the name in my classes at the University of Chicago) was pure common sense. There was also, in Reagan's first year, his response to an illegal strike by federal air traffic controllers. The president fired and replaced them with military personnel until permanent replacements could be found. Given union power in the economy, this was a dramatic act—especially considering the well-known fact that the air traffic controllers union, Patco, had backed Reagan in the 1980 presidential election. And, of course, there was the decontrol of oil markets. Price controls at gas stations were lifted in January 1981, as were well-head price controls for domestic oil producers. Domestic output increased and prices fell. President Carter's excess profits tax on oil companies was repealed in 1988. Even Reagan's first Democratic successor, Bill Clinton, followed in his footsteps. The negotiations for what would become the North American Free Trade Agreement began in Reagan's second term, but it was President Clinton who pushed the agreement through Congress in 1993 over the objections of the unions and many in his own party. President Clinton also signed into law the biggest capital gains tax cut in our nation's history in 1997. It effectively eliminated any capital gains tax on owner-occupied homes. Mr. Clinton reduced government spending as a share of GDP by 3.5 percentage points, more than the next four best presidents combined. Where Presidents George H.W. Bush and Bill Clinton slipped up was on personal income tax rates—allowing the highest personal income tax rate to eventually rise to 39.6% from 28%. The true lesson to be learned from the Reagan presidency is that good economics isn't Republican or Democrat, right-wing or left-wing, liberal or conservative. It's simply good economics. President Barack Obama should take heed and not limit his vision while seeking a workable solution to America's tragically high unemployment rate. Mr. Laffer is the chairman of Laffer Associates and co-author of "Return to Prosperity: How America Can Regain Its Economic Superpower Status" (Threshold, 2010).